Are girls all sugar and spice and everything nice? Not exactly. 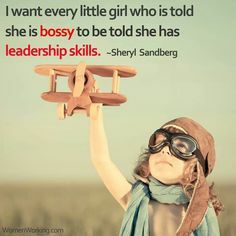 Sheryl Sandberg, author of Lean In and COO of Facebook, says “I want every little girl who’s told she’s bossy to be told instead that she has leadership skills.” The website, A Mighty Girl, was “founded on the belief that all children should have the opportunity to read books, play with toys, listen to music, and watch movies that offer positive messages about girls and honor their diverse capabilities”. It has over one million Facebook followers. In a world of princesses and pinkalicious, it’s time for all children to have strong voices, to know what they need to solve problems, and to feel capable and successful. It’s especially time to raise the glass ceiling on preschool gender stereotypes and let girls be girls. Change begins at home as we help every child discover their age-appropriate power and their fullest potential. Powerful fearless girls may be loud and active or they may be quietly determined, either way they are the children who know what they want and fight hard to get it. Look out parents, powerful children keep you on your toes. And at times, you may find yourselves in no-win power struggles. But, with a few sanity-saving tips, you may discover these little powerhouses can be masterful and helpful rather than oppositional and defiant. What is a powerful fearless girl? In my experience, these are the girls who are extremely self-directed. They embrace novelty and change, eager to try new things and find the biggest challenge to prove what they can do. And, if they can’t do something, they remain determined to try and try again (or, defiantly walk away until they figure it out…they will be back). When they succeed at doing something, they swell with personal satisfaction, self-pride and pure joy because they are internally motivated and confident risk-takers. All these traits are evident before they are two years old, and some parents report seeing these traits while they are still babies. 1. Let them lead. One mom described a constant battle over walking hand-in-hand with her not-yet-two-year-old. If she insisted on holding hands, her child would crumple to the ground in the least cooperative way. She could have scolded and cajoled all day long without success. Instead, she asked her daughter to hold her finger – immediately her daughter proudly accepted the “new way”. The solution was to “let her child lead”. Look for ways for your powerful child to have more responsibility, not less. To be more active, not passive. To be helpful, capable and strong. 2. Think three steps ahead of your child. Powerful fearless children are SMART. They are chess-players at life, looking ahead and leaping into a new and exciting world. In some ways, they expect to “win” – that feeling of being masterful and able. Expect your child to be fast, curious, and all-in. Before you try to unload all the beach paraphernalia, be sure someone is heading down to the water with your child because you know she is bolting into the biggest waves as soon as she sees them. Reason and patience are going to take years to develop. Your fearless powerful child needs you anticipating her strongest desires. Remember, she doesn’t mind failure because she believes she can do anything. You are her safety net and her coach helping her to evaluate risk. Her successes will be great though there may be a few heart-stopping moments along the way. 3. Be prepared for judgment and criticism. Your fearless child is strongly driven from within and not all that concerned with what others think of her choices. Yes, teach her how others feel when she stomps over their toys or boldly grabs for what she wants. She may need your redirection in social settings, reminders to ask for what she wants and assistance waiting for her turn. She can and will be empathetic as she leads others on adventures. She also can learn to watch and follow in order to acquire new skills and enjoy new things. Keep her engaged, interested and involved. Try to avoid labels like bossy or mean-girls at an age when children are experimenting with social power and are not malicious or intentionally hurtful. Toddlers and preschoolers are learning about social rules and effective ways to act, to speak and to listen. Teaching kindness and empathy matter. Powerful children learn best when challenged to do better not when made to feel small for poor choices. Bravo for a new generation of lean-in, stand-up and be heard children. Bravo for ever growing STEM (Science, Technology, Engineering, Math) toys and experiences for boys and girls. Bravo for busy, active, thinking, doing children who will be the leaders of tomorrow.